Advances in unified eClinical technology offers features and functionality that, when effectively designed, provide key benefits to every member of the study team, dramatically changing how studies operate. We’ve highlighted some key overall benefits, as well as benefits by role, below. With real-time visibility into your study data and site activities, your team has the ability to make course corrections or adjustments sooner – for a more informed study. A unified eClinical Suite reduces both the financial and task footprint across all roles within the study. No longer taxed by extensive manual processes, study teams are able to do more and manage additional, or larger studies with fewer resources. Automated tasks also greatly reduce the likelihood of manual errors. A unified platform is an investment that will see overall study costs trend lower over time, and freeing up team resources who are less burdened with manual processes and management of multiple tools and vendors. Reusability of your study designs or components leads directly to multi-study savings when a single vendor with a full suite of capabilities is selected for all future studies. Time to FPI is reduced as fewer vendors need to be mobilized and coordinated. Study start up happens in 4-10 weeks, not months. Close studies faster, as integrated data means no lag time due to manual tracking and excel file reconciliation. More accurate monitoring reports, greatly increasing visibility to study data. Simplified review of data with customizable flags/colour coding of data (out-of-range/overdue/key information) throughout the system and in standard and custom reports. Ability to better control study costs, fewer additional change orders/unexpected billing items. Lower study cost overall. Multi-study savings. More compliant study and more real time, integrated information and insight into study activities and issues, allowing for timely action to resolve problems and keep studies on track. Elimination of significant manual tasks, such as spreadsheets, and the associated costs/hours responsible for these actions. Automated tasks reduce possible manual errors. New team members up to speed quickly and easily when turn-over occurs. Fewer vendors to manage and no vendor integration needs or costs. Study launch is expedited, as fewer vendors need to be mobilized and coordinated. Faster study close out as integrated data means no lag time due to manual tracking/excel files being reviewed/analyzed. Selecting a unified eClinical platform can solve your top study management challenges. 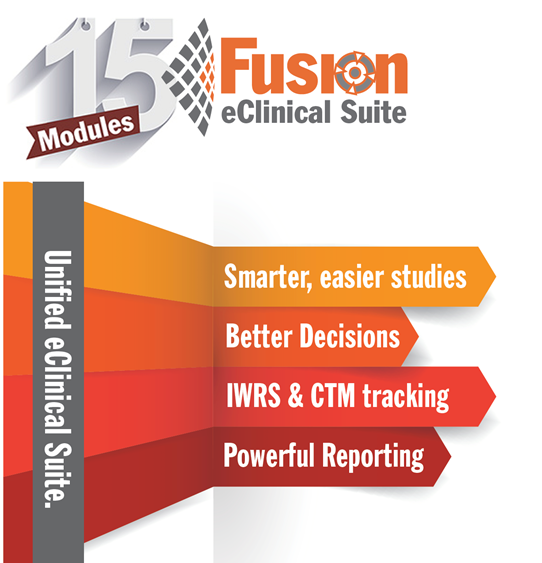 Learn how in our published article from the 2013 Clinical Trials Yearbook 5 Key Benefits to a Unified eClinical Suite.